Ryan Ruffels made it back-to-back titles after claiming the Australian Boys’ Amateur Championship with a stellar win at Kooyonga Golf Club in South Australia. Ruffels was the only player to end the tournament under-par finishing at 15-under with rounds of 70-72-65-66. In the process the young Victorian created history as one of only two players to successfully defend the Boys’ title, the other being Adam Scott in 1997-98. Ruffels, who turns 17 later this month, has another year of eligibility for the event and is keen to return to defend his title and make it three from three. “It will be nice to make it three times and if I’m not playing in the Masters next year, I certainly want to give it a go,” said Ruffles. On the back of a stand-out 2014 Australian summer which included a top-25 finish in the Australian Open and a T17 finish at the Australian Masters and a T3 at the Victorian Open, Ruffels’ game has gone from strength to strength since he became the youngest winner at 15 to claim the Riversdale Cup in 2014. “I’m hitting the ball further than when I won at Riversdale and that’s enabling me to attack courses more,” said Ruffels. Winning breeds success and Ruffels continues to win the big events. The 2014 Callaway Junior World Golf Boys 15-17 years Championship title saw Ruffels world amateur ranking rise sharply, which was underpinned with a victory at the Aaron Baddeley International Junior. 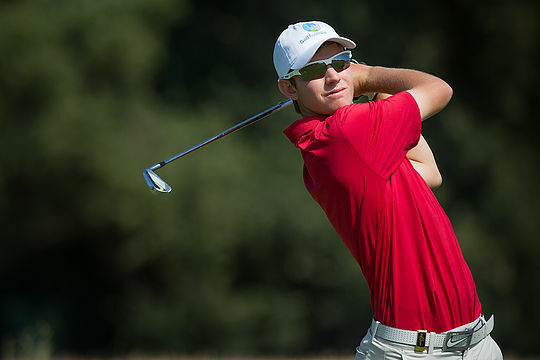 Ruffels is our highest ranked world amateur sitting inside the world’s top-20 at 16th and with an American summer on the schedule following commitments with the Interstate Series in Melbourne later this month, Ruffels is eyeing off the top-ranking. Ruffels’ fifteen stroke winning margin to claim this Australian Boys’ title was simply a stunning effort. Ruffels blitzed his nearest rivals and proved why he is one of our most promising talents. Jason Hong was runner-up at even par with New Zealand’s Daniel Hillier in third position at 1-over.